After a lot of polishing, testing and hard work, here's the update I promised. You can find download links at THIS PAGE. There's been many improvements and fixes. If you had trouble running the game on Windows 8, you can try this new version. Doc, you did an amazing job polishing the demo, it's far to epic, the difficulty settings, everything is just too awesome for be real, love the missiles sprites, the sprites of Samus standing still, the hard mode it's a total challenge and the biggest surprise was the Gamma metroid, Killed me twice (hard mode), You deserve to be famous for all the work you put in AM2R and keep the good work, looking forward for the updates. Excellent work as always Doc. Yes! Thank you, I was waiting for a save slot demo before starting another game. I deleted my entire old game by mistake when I fumbled and hit "New Game", so this is really great. Man my WHY DID MY CONTROLLER HAVE TO BREAK!!!!! could you add a feature to the logs alert to automatically pop up instead of having to press start to do so? Hard mode is awesome; the updated enemy AI really was a nice surprise, and I appreciate you keeping the energy tanks at 100 units per tank instead of 50 like in Zero Mission. A couple of things I noticed, though. Even though the missile upgrades are only worth 2 in hard mode, they still refill your current capacity by 5 whenever you get one. I also think it would be a nice addition to add a warning chime when you get to low health like in all the other games. I also agree with other people who think the Metroids should drop energy/missiles when destroyed. Overall, great update. This is my third playthrough, and I still was surprised by some of the enemies (especially that Gamma! Definitely had to run away and save before facing it.) Also nice to see some credits! Why not do what the guys with the nintendo remake did and finish the game and THEN polish things and add things in the later demos. It would do a lot to let people finish the game. HOLY CRAP doc! That was the most ingenious surprise ever. I nearly ran out of missiles fighting it, but I beat it with four left. It was a bit tricky to hit and didn't seem to have many attacks, but very cool nonetheless! While it looked very good, it did seem to be lacking a bit in things like sound effects. I won't spoil it for anyone who hasn't played through the new version. I'm trying to run the game on Windows 8, and it doesn't work. The up arrow key does nothing, and it acts as if the up arrow key is "stuck" when I go to the key settings menu. Thought you should know. Great job on the demo, doc! I can see Hard mode getting pretty brutal later on. The second Breeding Grounds alone killed me quite a few times, and I had to backtrack to the save station twice in order to even hope to have enough Health and Missiles to get through. The Gamma surprised me, and I died several times against him. He's the reason I had to go back to the save station a second time. Fighting more of those in the next sectors is gonna be brutal without Super Missiles. Awesome, loved it. Was surprised to actually see a beta. Although it does help newer people get use to the beta's before being fully assaulted by them. They do seem quite large. Enjoy the multiple difficulty. All the way though It does seem quite 'flawless'. I say 'flawless' cause there might be somethings to others that might need work. I enjoyed the update to the Footsteps dependent on the terrain that we are on. Gives it more atmospheric depth. My specs: Windows 7 Home Premium, Service Pack 1, 64 Bit, 6 GB of Ram, AMD Quad Core 1040 Ghz. Still in demo I know but just helping out here. just finished the demo n d it was fun to discover all the little changes. First of all the shocking gamma worked... I'd never expected something like that. I beat it with my last missle. During the battle I thought that it might be cool if the gammas have a different battle theme. This could imply the higher threat of evolved Metroids. But maybe you allready thought about that. I'm so eager to see this project finished! This is great. Sometimes walking up a slant can be harder than it ought to, but I was really surprised at how great this is. How the heck do you get that one Missile pack that seems to be all on its own above the ceiling? I've been in all the rooms around it, but can't find any morph ball tubes for it...? Bon travail jusqu'à présent! Je viens de tester la dernière démo, mais j'avoue que j'ai eu du mal à battre les Metroids (fallait trouver leur point faible) et Arachnus. Même en niveau "facile", la barre est déjà très haute! Autrement, j'adore les musiques et les graphismes; j'aime aussi la maniabilité de la Boule Araignée grâce à la configuration des commandes, dans le menu Options. J'attends avec impatience la suite du jeu... Bonne continuation et good luck! Ahh so amazing! Love the gamma fight, totally tricked me. I had to run past him and save/heal before going back to finish him off. Still sad that there's a pause before you move when coming out of a crouch. I guess I'm too used to the SNES version. Still wish the earthquake sound was a little louder (or maybe the music went down.) I wanna FEEL the planet get angry about my killing-spree. After Some 'Playtesting 97 % of the Items, i cant wait to play the Full Version. Hey Great Job Doc, im Happy to see this is still progressing, of Course i say that all the Time. I always loved the 2d Metroids. Hard mode is Awsome ! Thank you and keep it up ! Runs super on Win 8 !No errors finishing it ! Absolutely love it! This is amazing to play through, fantastic work! I can't wait for this to be finished, I'm really looking forward to it! The first and biggest is that, while I want to record a playthrough, I'm unable to. Through some combination of updates the software I use, PlayClaw, no longer recognizes the AM2R demo as a game which means I can't use it to record. I'm guessing this has to do with PlayClaw's end and not yours, which is too bad since it means there's no fix. The second problem is that when I selected "Quit Game" from the menu, the my Windows 7 machine reported that the game crashed. Not a huge deal since I was quitting anyway, but I thought you might want to know. If it helps, it's Windows 7 Pro, the game was running in full screen, and I had changed some joypad settings. Neither issue is a big deal imo. The first one is a shame, but I'll live. Can't wait to play more! Absolutely amazing! Loved the Gamma! One small thing, in the shaft before the high jump boots room it is possible to get stuck if you reach the bottom of the shaft after you've used up all you missiles. The Spider Ball just falls off the moving platforms and there are few enemies to either die on or get missiles. It IS possible to get back up the shaft using lots of wall jumping but it is extremely difficult. I suppose you could have a missile pack like in Super Metroid right before the Shine Spark. Just in case. its great! i noticed one little difference in something though. you took away the ability to climb ledges while in vents where you have enough room to stand and even jump. im also very glad you fix the incorrect text for the "spiderball get!" now i can use it this time around instead of infinite bomb jumping to get to high places. Every demo release is better and better! Right now my only (super super minor) complaint is when the spring ball is disabled and you press jump you don't unmorph but that's so minor since the spring ball is so early in the game. I'm just happy I can aim up/down with 2 separate buttons! awesome work. keep it up! Great work! every demo release is better and better. My only (super minor) complaint is that when you don't have the spring ball activated you don't unmorph when you press jump but that's sorta irrelevant because the spring ball is so early. I'm just happy I can now aim up/down diagonally with separate buttons so I'm a happy camper. The Hard Mode enemy behaviors are hilarious. Cool improvements, but I will skip this one. I'd really rather just play the full game when it's out at this point, so let's see it! Noticed two bugs: a missing "scanning environment" sequence, and one in the logbook. After destroying the 1st alpha, the screen shakes, prompting environment scan for "Earthquakes", but the "scanning in progress" part doesn't take place, only the completed log a few seconds after. This leads into the logbook bug, newly revealed logs don't display that they can be expanded. They still can be, but lack the white arrow that shows it. The arrow appears after navigating away from the page, however. In addition, whenever a new log shows up, some of the old "new logs" lose their arrow again. Your work is fantastic as always, and I know you'll continue to blow us away. Thanks. I just found out that holding charge draws in your refills, extremely awesome addition there I am just dying for this to come out. This is an amazing demo doc. 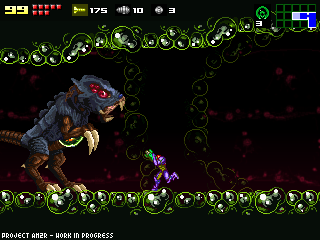 I was waiting for a remake of metroid 2 for the longest time and I gotta say, this go's far beyond what I was expecting from a fan game. Its as if Nintendo did this themselves. I also like how challanging you made the metroids compared to the original game (very satisfying). I tip my hat to you sir and can't wait for the full game release. Amazing work! Congratulations and thanks! I haven't tried the demo yet, but I'm excited to do so. Your previous work has been very high quality. 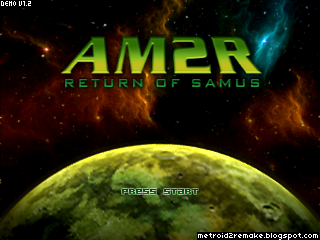 Being a frequent user of emulators, I keep becoming so entrenched in AM2R that I instinctively keep trying to hit the 'Save State' key -- your work is that close to Nintendo's. WOW This project is NOT DEAD! Great demo, like an entirely new game. Also loved the Hydro Station theme. Reminds me of Hot Head Bop from DKC2 as well as the Tallon Overworld Depths theme from MP1. But there is one big problem I have with an otherwise flawless and awesome demo. I swear that there's some kind of issue with the Gamma Metroid's hit detection. I'll shoot a missle dead center on the green membrane, and the missle will just bounce off. That's my sole nitpick. Exelente todo el trabajo y esfuerzo que has puesto en el juego, ciertamente un regalo para los fans de metroid, la ambientacion es fiel a lo que es metroid la musica es magnifica y la jugabilidad una replica perfecta del original. I hope that this project will end soon because I'm not holding more waiting, I got scared when I entered the area and was there waiting GAMMA, very good work can not wait the full paper. I'm here wondering if this thanks to his work at nintendo do not resolve the continuation of the game. I'm glad you've done as good a remake. Nice work so far. Strangely, my Logitech Dual Action Pro can't be read, however, my generic Gigaware pad could be used my the game... odd. awesome demo. It was still fun to play though the frist two areas, searching for the new changes and stuff. And let me say that I love the hard mode and the fact that it's available right from the beginning! While battling it I thought it would be cool if higher evolved metroids (Gamma, Zeta, Omega) have a differnt battle theme. Just to imply the bigger threat. As always, your update made my day. Keep it up Doc, this is going to be a masterpice for all fans! i'm trying to play this game with my wii remote + bluetooth dongle (like i do all my games on PC). when i go into control settings with the keyboard, the cursor scrolls by itself through every option, top to bottom and back up again. can't make it stop. help ? Hey doc, I love the new demo, plays great, loads fast and more importantly, has none of those anoying things the other 2d Metroid games had. I may have found a bug: The chozo boss' track seems to draw over items, hiding a few when samus destroys it and it also covers samus when she jumps. Given the fact that the machine looks down at Samus and it's holding onto the track, it should be drawn further in the back. I recently completed the demo, great work. However, my run in with *spoiler* the Gamma kinda tended to be really lopsided, as in, it took quite a while to actually hit the weak point (more often than not, I realize I waste more than half my ammo trying to kill one). And that response team that answers the distress signal from the research crew, if I read the Super Metroid manual correctly, that was actually a Federation Special Ops Team (or an elite corps) that went MIA. I've been watching your Project since it's earliest hours (Tech demo and so on). I love this game and this feeling grows bigger with every new update. i am awaiting the final Version for Let's playing it. But still, i will play every new demo update you post. Keep going pal, you rock. Excellent! Can't wait for the full version! But did anyone else think the Gamma was easier than the Alphas? It's slower and the eletric attack gives you a great opportunity to hit it. Really nice job, thanks for your efforts in making such a great tribute game! ¡El juego está quedando más que asombroso! No comentaba desde mis sugerencias con el comportamiento de los Metroid y la Reina. Actualmente sólo tengo una pequeña queja: Por alguna razón, el juego corre lento, CORRE, pero lento. La música bien, los gráficos pulcros, pero la velocidad de movimiento está muy reducida a pesar el alto rendimiento de mi pc (uso windows 7, tengo 2GB de ram y un procesador ATI Mobility Radeon HD 4250). Estoy seguro de que existe algún problema de compatibilidad (si es que no soy el único con el problema), pues en versiones anteriores el juego corría en tiempo real, bajo las mismas condiciones. Tengo entendido que estás trabajando con Windows 8, ¿tendrá eso alguna relación? Sigue así con el proyecto, y si arreglar este supuesto problema implica modificar aspectos técnicos del juego, DÉJALO COMO VA.